A month has passed since the catastrophe at the Fukushima nuclear plant. The levels of radioactivity have been increasing day after day and have finally reached Level 7, the maximum on the international scale, this despite the alternating announcements and denials by the national nuclear agency, Tokyo Electric Power Co (TEPCO). 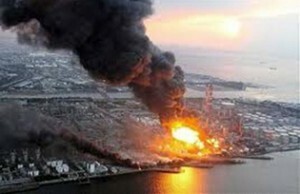 The Fukushima nuclear plant, damaged by the earthquake and the subsequent tsunami, which hit the north eastern coast of Japan, with 11 meter high waves, is now endangering the lives of millions of local inhabitants, obliging all those countries that produce nuclear power for civilian use, to re-examine their commitment to nuclear power. The fission process was triggered in the cores of reactors 2 and 3 due to a breakdown in the cooling system. Radioactive material has been leaking out of the reinforced concrete barriers that enclose the reactors and the fuel. The same highly radioactive water that was used to cool the reactors, while the cooling system was being repaired, was dumped into the surrounding area causing huge rises in radioactivity in the soil under the plant and in the sea nearby. However, it has been difficult to arrive at the facts. Tepco has been slow in announcing news, if not entirely reluctant to do so and on occasions has delayed the announcement of news and facts that would allow us to piece together the exact nature of the environmental disaster that is taking place. The truth is now finally reasonably clear, we are facing a disaster of huge proportions that seems to be nearing biblical proportions with every passing day. It also appears to be clear that the technicians are not capable of stopping the fission at the two reactors, one of which, number three, is enriched with plutonium so poses the greatest danger. The international reaction to the tragedy was immediate, over and above the support offered to the Japanese authorities by the USA and France, given the unsatisfactory response by the national nuclear agency, (which is in fact private and not national). The emotional “tsunami” which hit the world, was a powerful one. The German Chancellor, Angela Merkel, was quick to announce that “the sooner Germany bans nuclear power, the better”. However, this did not prevent her party from suffering a significant electoral defeat soon afterwards. In Italy, another country with a centre-right government, the Berlusconi government imposed a moratorium of one year on the government’s commitment to build nuclear plants. This was a tactical announcement though, to avoid a possible defeat at the next local elections in May and at the June referendum on nuclear power. Even President Obama stated that to abandon nuclear power the country needed to be much more committed to renewable energy sources. However, this is something that Obama’s administration has been supporting since the beginning of his presidency. The European Union has announced stress tests on all of the nuclear plants in the EU, to determine the state of Europe’s plants, some of which are as old as the Fukushima plant. Nevertheless, the reality is that you can make all the calculations you want, but you can never hypothesize exactly, and therefore avoid with certainty a possible natural disaster, so as to ensure the safety of nuclear plants. The dimensions of disasters imagined by man never match with those invented by mother nature. The Japanese earthquake and the devastating tsunami, demonstrated the futility of the security systems – presuming that these systems were as advanced as the Japanese government has led us to believe. The only positive note in this tragedy, which the world is watching in a rather bored fashion, much like the distractions of the war in Libya and the uprisings in the Arab world, is a reawakening of an ecological conscience. In Germany, where the elections for the Lande were held just a few days after the tragedy at Fukushima, the Green Party, which has been suffering in terms of popularity and votes in the last decade saw a sharp rise in the number of votes it received. In Italy, the upcoming local elections could now be a shot in the arm for those parties that oppose nuclear power. The Japanese government has been accused of waiting for the end of the elections held on 10 April, before giving the news that the level of alarm had reached the highest possible level of 7. In France a reawakening of the environmental parties could play a decisive role in the upcoming presidential elections. Over and above the fact that some parties, for opportunistic reasons, are “riding” the Japanese tragedy, fuelling nuclear fears, the Fukushima incident is offering new reasons to ban nuclear power in Europe where there are currently 195 active plants. Eleven more plants are being built in Russia. Governments are being asked to show greater commitment in the research of renewable sources of energy. Wind and solar power appear to be the main alternatives to oil and nuclear power. The re-conversion of northern European countries has been ongoing for some time, but this process could truly take off if the search for alternative sources of energy becomes the locomotive of Europe’s economy in the next few years.